Each month we spotlight new or exciting Australian businesses which have either subscribed to Greenroom or are Alsco customers. We want to know what makes your business tick and how this can help other Alsco customers to create greener, safer and healthier businesses. Today the spotlight is on MyCatering. To help the Food Service industries in providing excellent customer experience, Alsco offers hassle-free and fully managed rental services such as well cleaned and sanitised food and beverage linens, crisp uniforms, clean and managed floor mats and more. MyCatering shares the same aim of providing solutions to both customers and vendors from the Food Service and Hospitality sectors – the hassle-free way. It offers FREE services to help the vendors and customers meet. MyCatering.com.au is a one-stop-shop online service which takes away the pain and pressure of organising any event or function, whether it is a wedding, a kids birthday party or a corporate occasion. Best of all it’s 100% free. Typically customers are tired of chasing vendors and having to constantly repeat their requirements & budget. And then how to make the right choice? MyCatering aims to minimize this via it’s free services. Customers simply submit their requirements and budget once for all their required services (caterers, venues, entertainers, florists, photographers, limos, hire etc). Then they simply sit back and wait for vendors to contact them. Vendors review the job details and if they think they can do the job for the indicative budget, they contact the customers instead. Thus effectively ensuring that customers are only being contacted by vendors are are comfortable with the customers requirements and more importantly their indicative budget. Already a few steps ahead of the negotiation process. For practicality, only a maximum of 5 vendors per selected service can contact the customer. Customers can then make an informed decision by reviewing these vendors’ detailed and strictly qualified feedback rating to make their selection. Simple, convenient, effective and free. MyCatering also aims to benefit the hospitality industry by leveling the playing field and allowing businesses of all size to have access to a growing number of jobs, minimising the need for expensive marketing campaigns. Instead of vendors spending thousands hoping to attract new customers, MyCatering instead brings customer jobs to all registered vendors for free. Already a huge win, without spending a cent. It’s then up to the business to review the details of the job and the indicative budget and only if they decide to do that job, do they pay a small flat fee to be one of the 5 vendors who can contact the customer. Currently, we are running a promotion where vendors pay absolutely nothing for a full year if they join up at www.mycatering.com.au/vendor. It’s then up to the vendor to convince the customer that they are the best choice for the job. If they achieve customer satisfaction, it potentially means good customer feedback leading to more jobs in future. MyCatering aims to allow more and more businesses to grow and prosper, using the most cost-effective method there is. Know more about them and what inspires them to come up with such great tool to help customers and vendors meet. 1. How did MyCatering come to life? The concept was conceived during my sister in law’s wedding. There was so much organisation that had to be done. So many wedding suppliers that we needed to ring around to try and get the best deals. It was just getting quite frustrating making hundreds of call to caterers, photographers, venues, florists, etc always repeating the same requirements and our budget over and over again. All of this while trying to maintain our day jobs. As parents with young kids, it was a similar dilemma when organizing their birthday parties trying to find entertainers like magicians, clowns and fairy princesses. Surely there had to be a more efficient way to utilise mine and the businesses’ time as well. MyCatering was the answer to this question. There was a unanimous approval of the concept from both potential customers and businesses we interviewed, who could see the benefit without the pain. The words “no brainer” kept popping up, so we knew that there was potential. My background in Hospitality has also driven my passion to get MyCatering running as I can see it greatly benefiting the hospitality industry and the economy, by providing a service where both parties benefit regardless of the state of the economy.During tougher times, customers would be even more conscious of their budget and MyCatering saves them the pain of finding vendors who would meet their budget. Conversely, vendors would welcome the additional stream of jobs MyCatering would bring their way. 2. If you’re not in your at MyCatering, where can we find you? And what do you do? 3. What’s the most challenging issues you’ve faced when you startup MyCatering? And how did you respond to it? The main hurdle was to find a solid technical partner with great ethics and an ability to go beyond what’s required. Luckily we found Thierry of TipTopWeb who saw the potential in the concept and agreed to join us on this adventure. Our ongoing challenge is to continually “Build, Measure and Learn” to strive towards a better product which will be responsive to the needs of both our vendors and customers. As such we always encourage people to provide us with their feedback. 4. How do you advertise MyCatering? MyCatering aims to tout its offerings through a myriad of social as well as conventional media promotions. Online mediums such as Facebook, Twitter, Instagram, Google+, SEO and Google Adwords are used constantly to maintain the public awareness. However, we also believe in the complementary impact of traditional media advertisements such as radio, paper, magazines, conventions, talk show and competitions. We also aim to advertise at peak seasonal times when traditionally certain events are prevalent such as a few months before springtime for weddings. For vendors, we’re affiliating ourselves with a growing number of Associations Australia wide which gives us access to offer our services to their members. We also run a regular telemarketing campaign Australia wide to introduce the benefits of using MyCatering as an essential medium to grow their business in the most cost-effective manner. 5. How do you picture your business 5-10 years from now? For customers, we envision MyCatering to be the one-stop shop for their event planning and for vendors as one of their main sources of growth and income. The one essential tool both parties (pun intended) can’t do without. 6. Is there something unusual you want people to know about MyCatering? MyCatering is a wholly Australian owned and operated mum and dad start-up, which is unique in this niche sector of the Australian Industry. 7. What sustainability practices do you do at MyCatering? And how do you think these can help the environment? MyCatering’s strives towards a win-win philosophy for all involved, customer-vendors and the natural space within which it operates. We are where possible conscious to minimise the impact on the environment but using energy saving utilities such as LED lights throughout it office premises, a heat pump hot water facility, solar panels and a recycled tank. We even have our very own fruit and vegetable garden patch for fresh organic consumption. We like the sustainable products and services offered by Alsco and are considering using their products to further this cause. MyCatering.com Pty started last 2014. They’re located in Sydney, Australia. 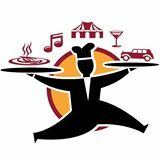 MyCatering is an online marketplace for customers seeking vendors for their events and functions. If you’d like your business to be listed in their website, visit www.mycatering.com.au. For a cost effective renting solution with fully managed and hassle-free services, enquire at Alsco. We take care of your business. Call 1300 659 892 now. 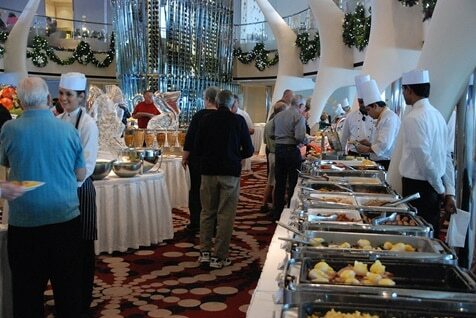 Image Courtesy: “Hot Buffet line aboard Celebrity Equinox” by Joe Ross from Lansing, Michigan – Hot Buffet line — Formal Brunch Aboard the Celebrity Equinox, 12-09-2011. Licensed under CC BY-SA 2.0 via Wikimedia Commons.